Touch a Greek word in the Septuagint (LXX) text and instantly view detailed morphology and parsing information, along with direct links to the related entry in the LEH Lexicon. The Kraft/Taylor/Wheeler Morphology shows the parsing code and the Greek lemma (lexical form) of each word. This version of the Kraft/Taylor/Wheeler morphology database is a new version, updated in 2008. 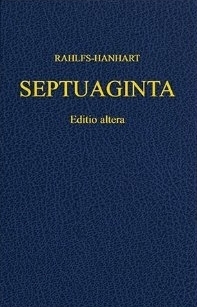 The LEH Greek-English Lexicon of the Septuagint, compiled by J. Lust, E. Eynikel, and K. Hauspie, provides a definition for each Greek word. The appropriate entry is hyperlinked from the words in the LXX text, you can choose to open the lexicon whenever you view parsing information. The LEH Lexicon is also independently accessible, so you can look up words without linking from the Greek text. This resource is also available as the text of the LXX text with the apparatus LXX with apparatus (no parsings).